Today, we are bringing you Opera 43, the fastest version ever, with instant page loading and Profile Guided Optimization (PGO) on board. Since web content is getting heavier and heavier, web browsers need to load pages faster and faster to keep up with user expectations. Last year, we sped up Opera with features like native ad-blocking, page-load speed optimization, and faster start-up. Now, with instant page loading and PGO, we’re giving it another boost that will squeeze loading time. Instant page loading is a technology that predicts which website you’re typing the address for. Once recognised, it begins loading the site in the background even before you hit enter. Instant page loading becomes smarter over time by learning which URL inputs led to a specific website. For example, if you type “nyt.com” on multiple occasions, it will learn from this and begin loading the New York Times in the background. In addition, when you search for something in the address bar, it will load the results likely to be clicked in the background. Opera can predict what page a user is going to load not only from its behavior, but also when the current page uses the < link rel=prerender … > tag. Another performance feature to land in the latest Opera version is Profile Guided Optimization (PGO). PGO is a compiler technique able to make software running on Windows significantly faster. 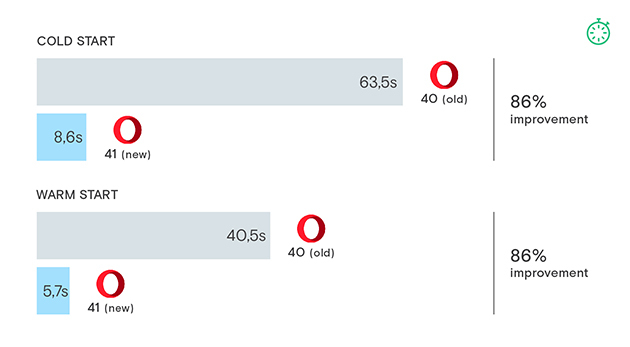 With PGO, we can teach the compiler what usage scenarios are important so that Opera can perform those tasks even faster, using even less CPU. PGO optimizes the most important parts of the browser, and brings some significant speed improvements. With this technology, startup is 13% faster*. Also, the browser engine has gotten a performance boost, confirmed by several benchmarks such as Speedometer (60.3% improvement compared to Opera 42), JetStream (7.7%), and Octane (3.35%)**. Test results on Speedometer after PGO. Higher score is better. – Use horizontal click-and-drag to select the text. – Use vertical click-and-drag to drag the link. 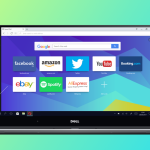 Download Opera 43 with instant page loading, and let us know what you think. *These results are from a computer running Windows 7 x32 using an i7-4600 CPU locked at 2.1GHz. In the startup tests, Opera was stored on an HDD. We’ve compared x32 build number 43.0.2442.686 (PGO) and 42.0.2393.78. **These results are from a computer running Windows 10 x64 using an i7-6500U CPU. We’ve compared x32 build number 43.0.2442.686 (PGO) and 42.02393.78.